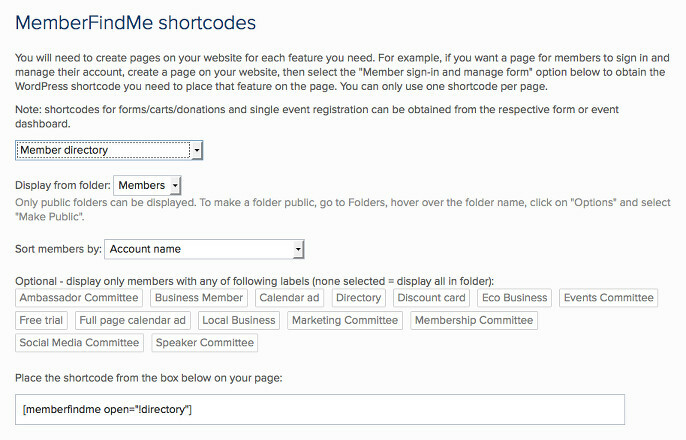 The new WordPress shortcode or HTML snippet generator makes it even easier to integrate MemberFindMe with your website. Simply select the feature you’d like along with the options for that feature. For example if you select the Member Directory, you can select options for which folder to pull data from, how to sort members, and whether you would like to limit the listings to specific membership levels and/or labels. Once you have the shortcode/snippet you can add it to the proper pages in your website. The shortcode/snippet generator can be found in the help section under Plugin or Website.